Shield Plus Cleaner is the PUP that uses misleading techniques to prevent removal. Use Reimage to locate malicious components and get rid of them faster than with uninstall instructions. A full system scan blocks virus reappearance and prevents traffic to malicious domains. What is Shield Plus Cleaner? How can Shield Plus Cleaner hijack my computer? How to remove Shield Plus Cleaner virus? Shield Plus Cleaner (a.k.a. Shield PC Cleaning Utility) is yet another application from Shield Apps. It claims to be able to clean up the disk, Internet Privacy, defrag module, and startup program management. Generally speaking, it is promoted as a must have PC optimization tool for Windows. However, you should not fall for believing that blindly. Security experts note that Shield Plus Cleaner is labeled as a potentially unwanted program (PUP). That’s because, in addition to the downloads from the official website, this application is also spread by bundling. It means that it may show up on computer’s system right after installing another freeware thus leaving the user confused about it’s coming. Beware that the main purpose of this tool is to convince people to buy a full version of the program which is quite expensive ($40). For this purpose, it employs a tricky marketing strategy. 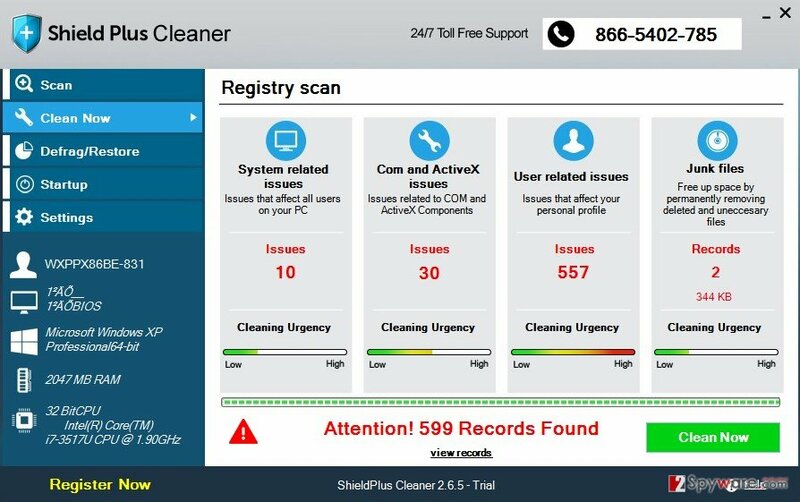 Shield PC Cleaning Utility may start initiated a full system check every time you turn on a computer. Right after that, it may present search results related to system issues, Com and ActiveX, user issues, and junk. Typically those results inform about hundreds of issues and urge people to take immediate actions to fix all of them in order to prevent system crashes, slowdowns, boot problems and other serious issues. However, you should keep in mind that only the minority of results may be trusted. The majority of issues may not be critical of absolutely negligible. Therefore, even if you are convinced that the only solution for those issues is Shield Plus Cleaner full version, you should not fall for believing that because there are lots of more reliable PC optimization tools. In addition, the longer you keep Shield Plus Cleaner virus installed, the more ads your web browser may generate. This doubtful program can display error alerts during your browsing and offer you to scan the system and buy the licensed version. Besides, you may start receiving various pop-ups and banners with the prompts to update software (Java, Flash Player, etc.) or visit third-party shopping websites. Therefore, in order to maintain your PC’s stability, prevent money loss and irritating ads from appearing, run a full system check with Reimage and remove ShieldPlus Cleaner virus from your PC’s system. You can download Shield Plus Cleaner from its official website believing that it’s a superb tool for PC’s maintenance. However, it is also spread via other freewares and sharewares and may be bundled with other potentially unwanted programs, such as Betfiiler.com, CloudScout, SaferPass, Savings Explorer, and so on. Thus, if you want to protect your computer from unwanted apps, you should always check Advanced/Custom settings when installing freewares and deselect all ‘optional downloads’ that are spreading in its pack. Press Start → Control Panel → Programs and Features (if you are Windows XP user, click on Add/Remove Programs). Here, find Shield Plus Cleaner. Uninstall it and other programs you do not want having on your computer. Nevertheless, we highly recommend you to rely this task for Reimage, Malwarebytes MalwarebytesCombo Cleaner or Plumbytes Anti-MalwareMalwarebytes Malwarebytes because, as we’ve already mentioned, Shield Plus Cleaner can spread bundled with other PUPs that may also be lurking on the system. This entry was posted on 2015-09-03 at 00:56 and is filed under System tools, Viruses. You can quickly scan the QR code with your mobile device and have Shield Plus Cleaner manual removal instructions right in your pocket. How did you remove Shield Plus Cleaner?